There’s no denying that Abilene is not the most fashion forward town. Chains are limited to Target and Ross. And customers seeking a younger, more unique look may feel discouraged by the lack of a large shopping mall. There is hope for these discouraged young people in the success of local boutiques. Over the years several Abilene residents have noticed a gap in Abilene’s fashion offerings and have stepped forward to offer designer clothing and trendy accessories. Jessica Jackson moved to Abilene three years ago and immediately sensed a gap in the fashion market. Eventually, she opened Betty and June, a clothing and accessory shop on Pine Street named after her and her husband’s grandmothers. Since its opening in 2011, Betty and June has been one of the most popular boutiques for ACU students to shop at. Jackson constantly evaluates the store’s content, working to fill their shelves with classic and trendy pieces that appeal to a wide range of customers. Most of their customers are younger but one of their most regular customers is in her mid ’70s. The store continues to expand as Jackson considers new ways she can impact the Abilene community. Recently Betty and June began offering men’s clothing and accessories. Another popular boutique in Abilene is The Arrangement, which will celebrate being in business for 17 years in October. The Arrangement offers a unique approach to shopping by combining a flower shop and a boutique that specializes in carrying coordinated outfits and jewelry. Flowers and fashion may seem like a weird combination to some, but to co-owner Lisa Bailey Cadillo, it’s a natural combination. “We feel like flowers and fashion go hand in hand,” Lisa Bailey Cadillo, co-owner of the store said. Price is an important consideration Cadillo makes regarding the items sold in The Arrangement. She realizes that a large portion of her customers are in high school or college and need to find clothes and accessories on a budget. Typically an outfit is not priced over $100. Jackson and Cadillo recognize the value of shopping at a locally owned boutique over national chains in the relationship developed between employees and customers. Jackson works at the store almost every day and if a customer comes in with a specific piece or outfit in mind, she can help them find and order it online. “There’s a rapport down here that you won’t get at larger stores,” she said. 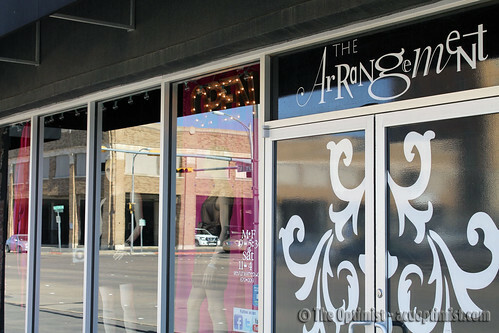 The Arrangement and Betty and June are not the only boutique options for Abilene residents. The Hen Shack on ES 11th St. stems from a country clutter hair salon and offers a wide selection of trendy clothes in a comfortable, down home atmosphere. South 27th St. is the location of Collections II, an upscale clothing store. These shops are evidence that fashion is available in any location.